Enlightenment Productions | Cover girls! 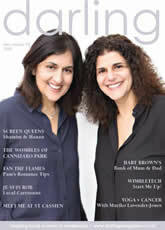 Featuring on the Spring cover of Darling Magazine as ‘Inspiring Women of Wimbledon’ are Enlightenment Productions very own film producers and award winning couple, Shamim Sarif and Hanan Kattan. Click here to read the article in the digital magazine or here to visit the website.